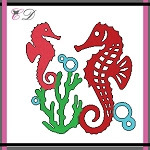 Gloria here today, I want to share with you a card using Seahorses die from Cheapo dies. 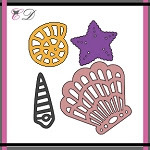 To create this card, I die cut the seahorses and seashells images from white card stock with Cheapo dies. I then colored them using Copic markers. I die cut the white circle part using Unbranded Dotted circle die set. For the blue background,I blended with bubbles stencil and cracked pistachio Distress oxide ink on light blue card stock using mini blending tool. Adhere the seahorses on the white circle and then mounted all elements on A2 size white card base using double-sided tape.